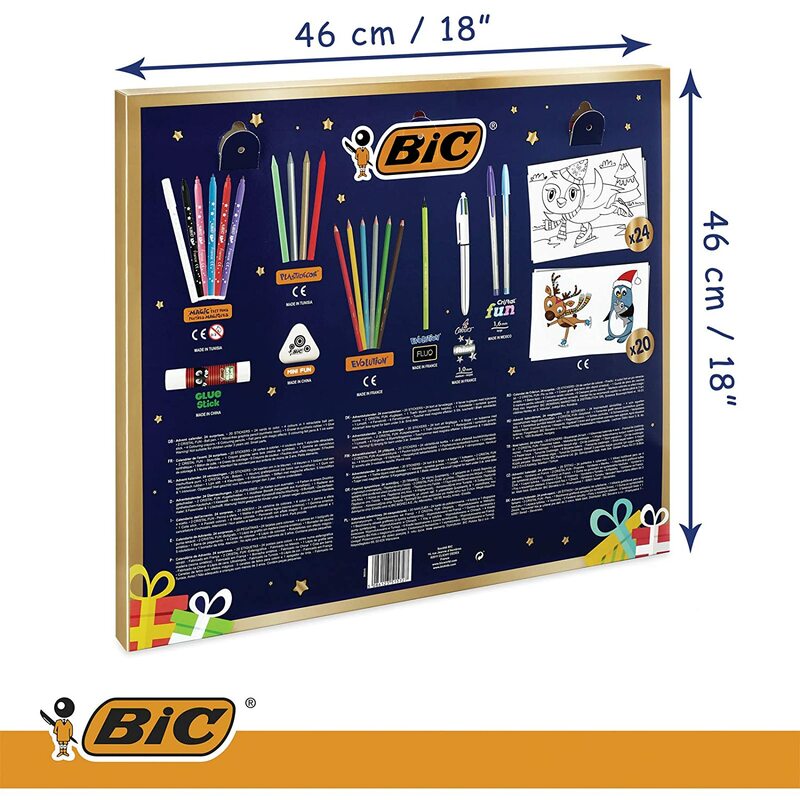 With the BIC Advent Calendar, children can make a new BIC discovery day after day in the build-up to the holidays. 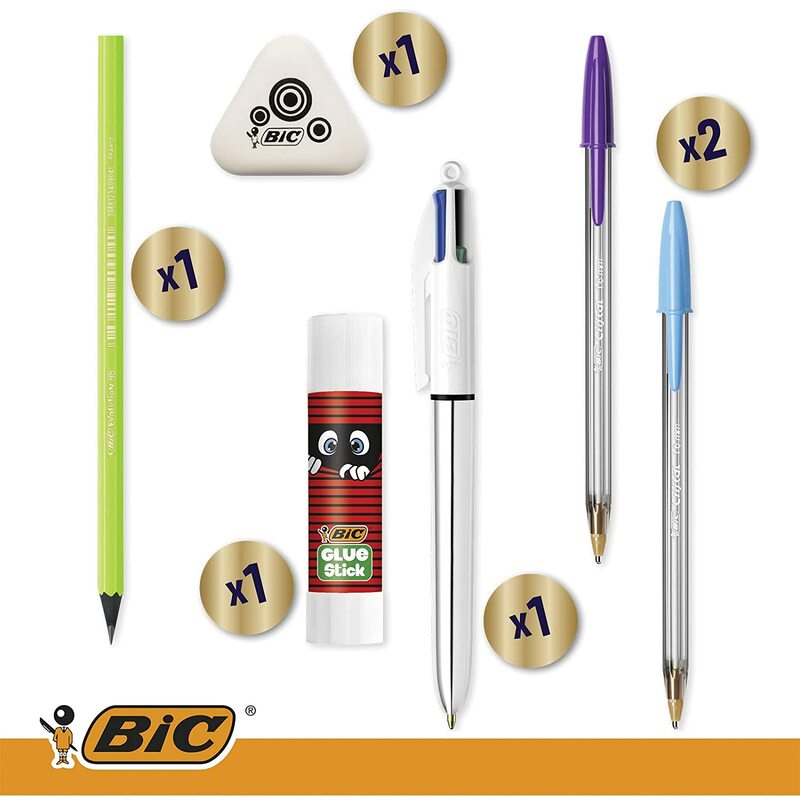 It contains an assortment of iconic BIC brand products: magic felt pens, colouring pencils, glitter glue, classic glue, graphite pencil, eraser, ballpoint pens and 24 colouring cards as well as 20 stickers. The 6 BIC Kids Magic colouring felt pens allow them to create special effects: with their two erasers included, it’s easy to correct mistakes or create special effects by drawing patterns on coloured surfaces with their erasable ink. 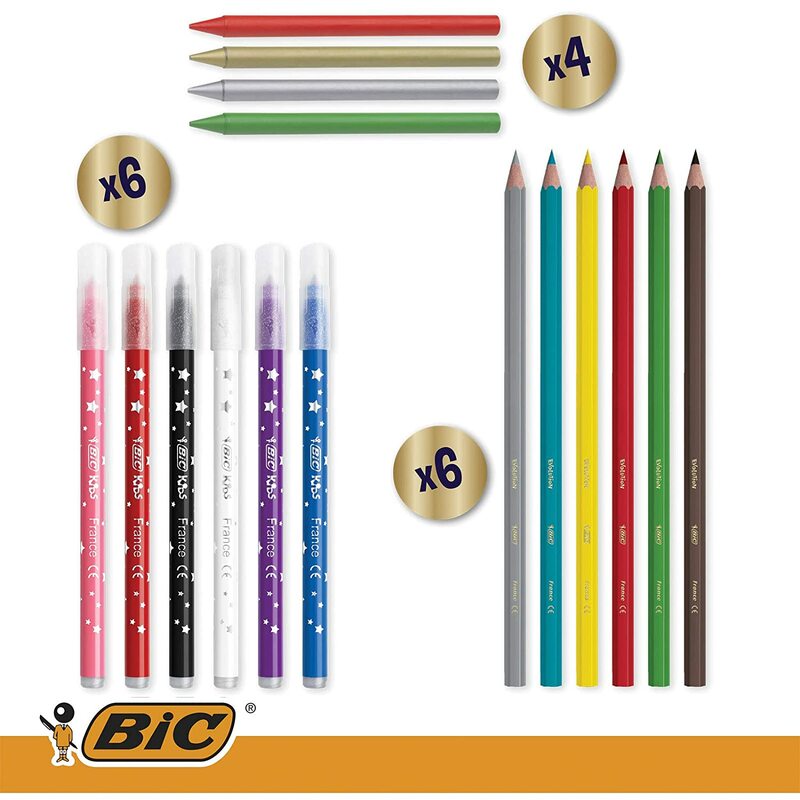 The 6 BIC Kids Evolution colouring pencils deliver high covering power thanks to their highly pigmented lead. They are made of synthetic wood-free resin, so there’s no fear of splinters and they have a very solid lead that won’t easily break. As does the BIC Evolution Fluo pencil, which will add a touch of style to your holiday preparations. Mistakes are no problem, they can be erased cleanly with the BIC Mini Fun eraser, PVC free and adorned with a fun pattern. The BIC 4 Colours Shine pen sparkles with a modern metallic coating. With four medium points, it is perfect for writing, drawing and organising notes or tasks, all in a choice of blue, black, red or green inks. The two ballpoint BIC Cristal Fun pens revisit the iconic BIC Cristal pen with their tip and cap matching the ink colour. For the little ones, the four BIC Kids Plastidecor colouring crayons are ideal for youthful artworks: resistant and easy to shape, they are just right for small hands with their 12 cm size and their lead is stronger than most round crayons to resist falls and pressure. A true classic, the decorated 8 g BIC Glue Stick will delight creative craft fans. Combined with the colouring cards and stickers, they can give free rein to kids' creativity. 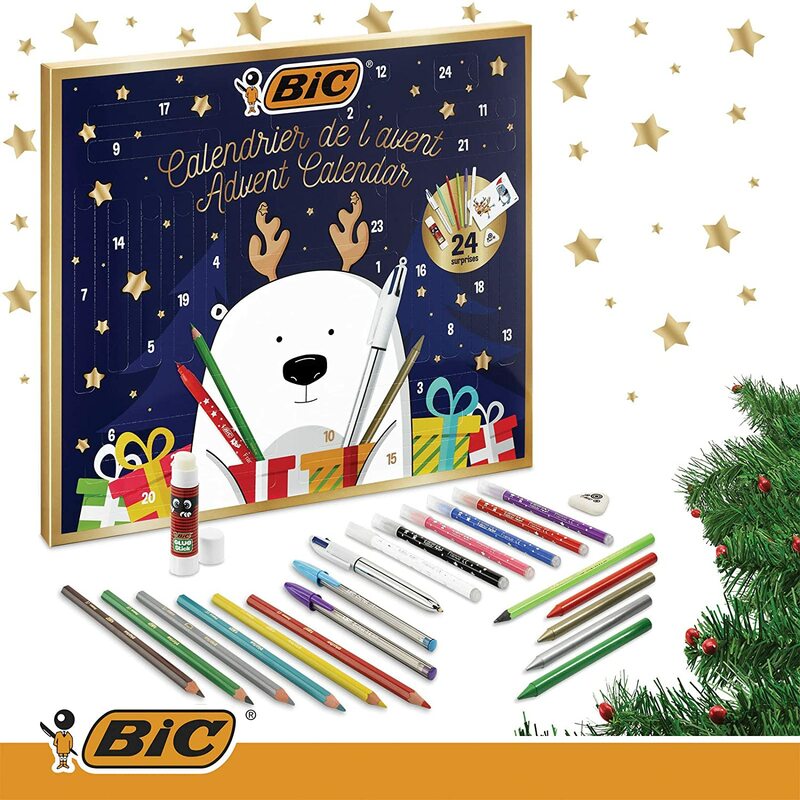 The holiday season starts here with the BIC Advent Calendar. 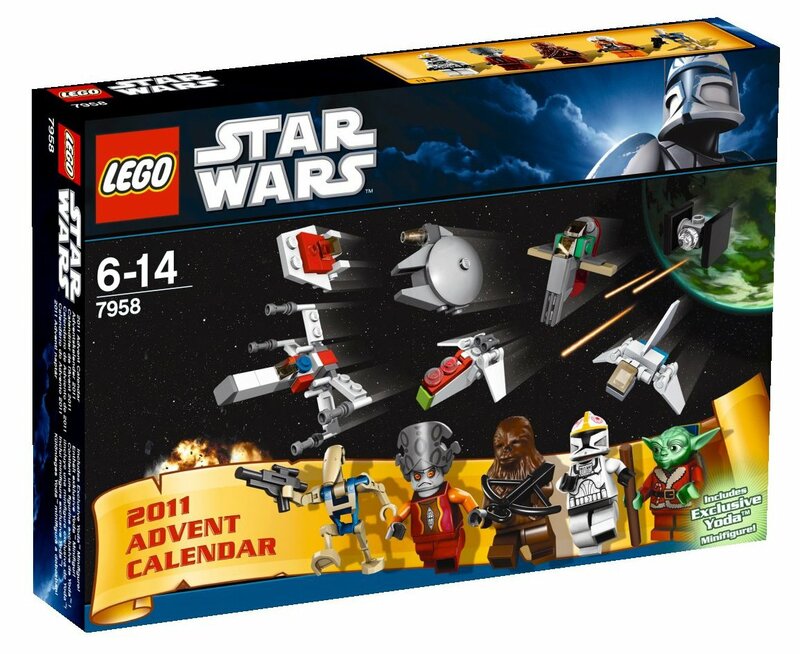 Over the last few years Iu2019ve seen advent calendars contain everything from make-up to Lego - but Iu2019ve never yet found the perfect advent calendar that contains something that I can really get excited about (except chocolate, of course!). I love stationery and I love Christmas so this is a match made in heaven for me. 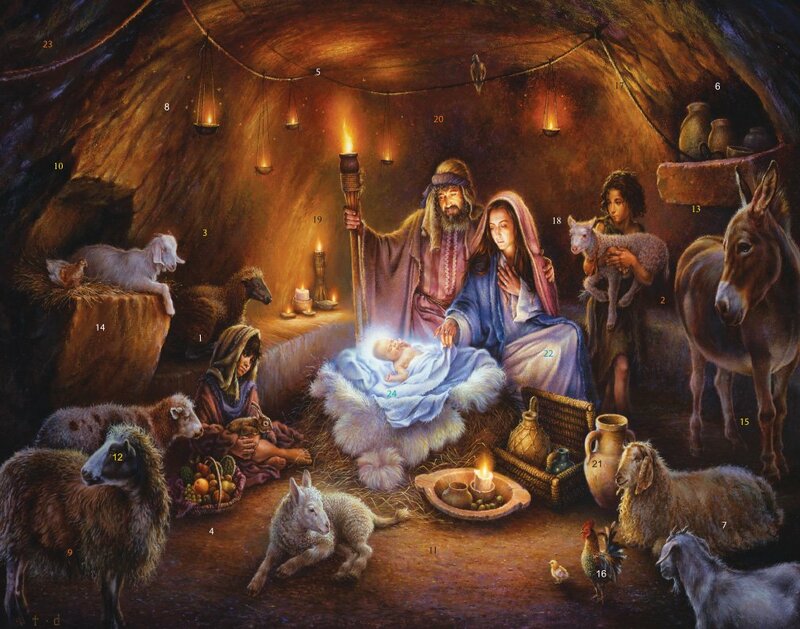 The picture on the front is absolutely adorable and has a lovely, festive feel. 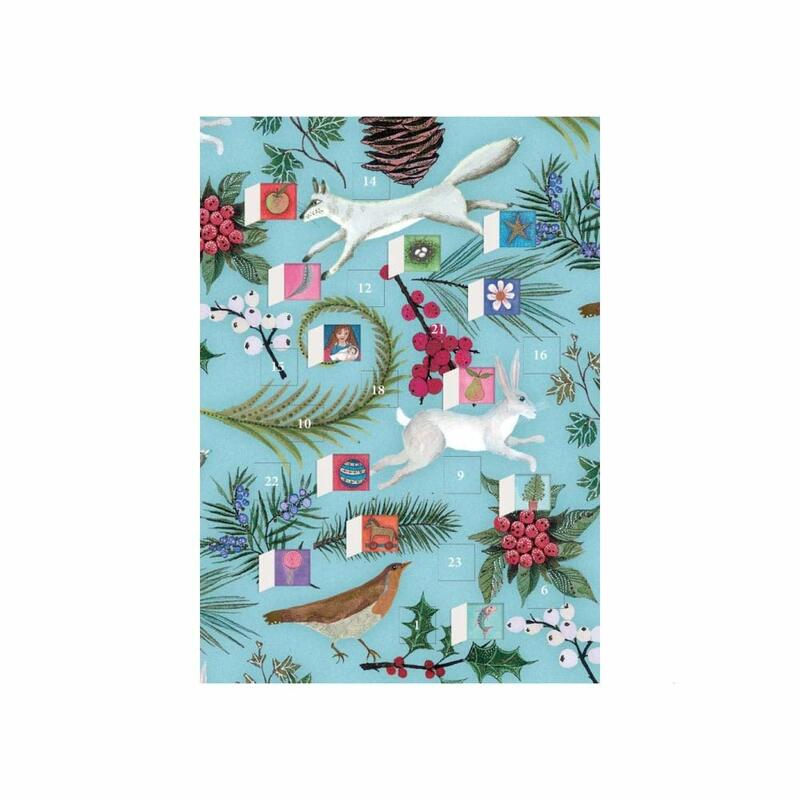 The advent calendar itself is quite large at about 41cm x 47cm - but it has to be to contain all the lovely stationery goodies that are inside. 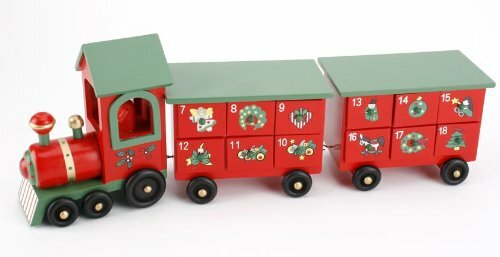 While the marketing and some of the products are clearly meant for kids - Iu2019m sold on this advent calendar and think that it would suit any stationery fan. The items are also in a sensible order with the cards coming first so you can then collect the other products across the days to use on the cards. 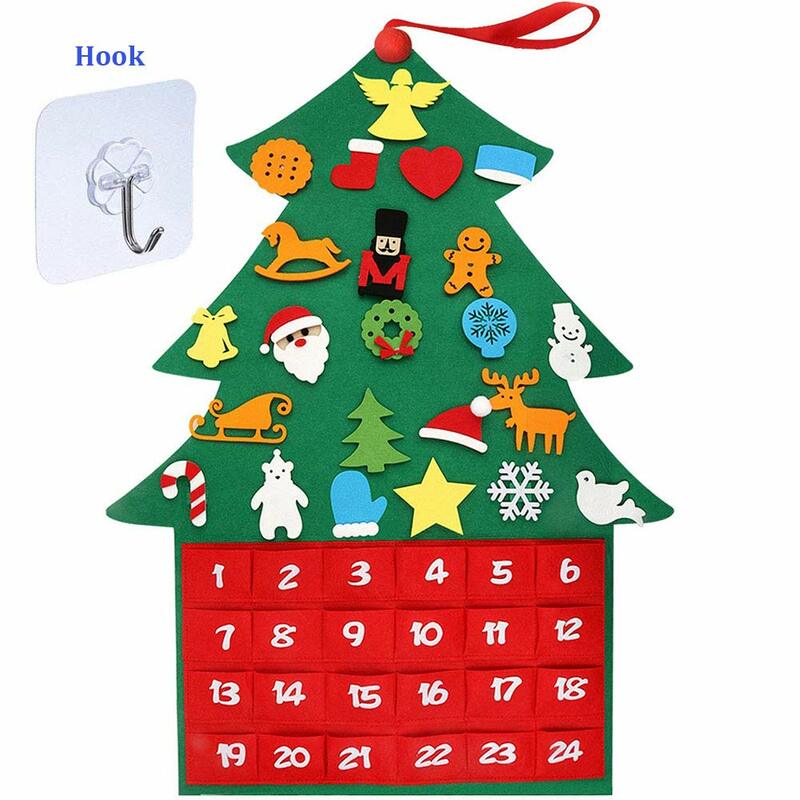 You really do get a lot of stuff from this calendar so I really feel at u00a319.99 at the time of writing, this is really good value. If you were buying this for younger members of the family, itu2019s also shareable with the pencil being the only thing that couldnu2019t really be shared like the other single items (glue and a rubber) could be. 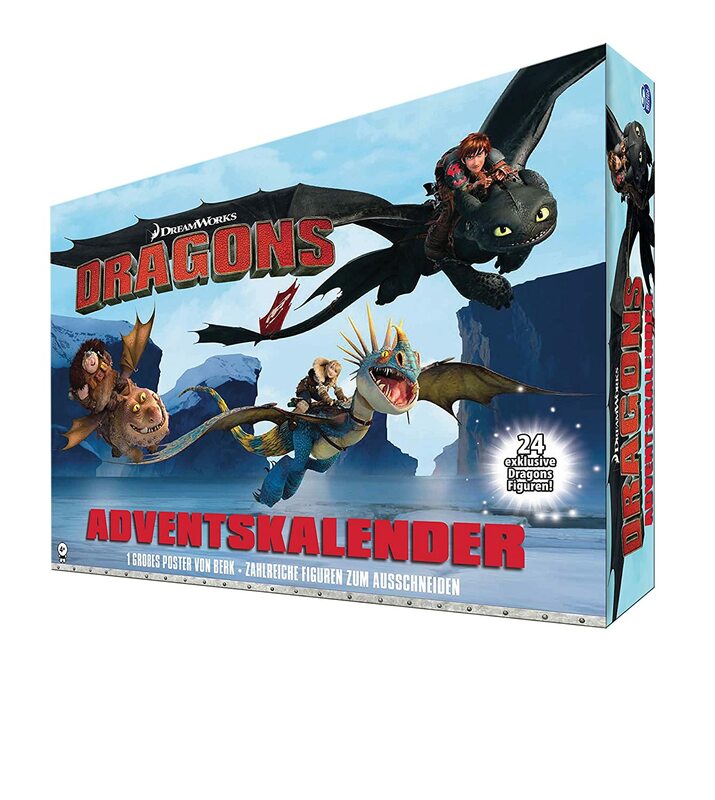 Overall, this is a fantastic advent calendar and one I would recommend to kids and adults alike. A great start to your Christmas planning. 5 stars. 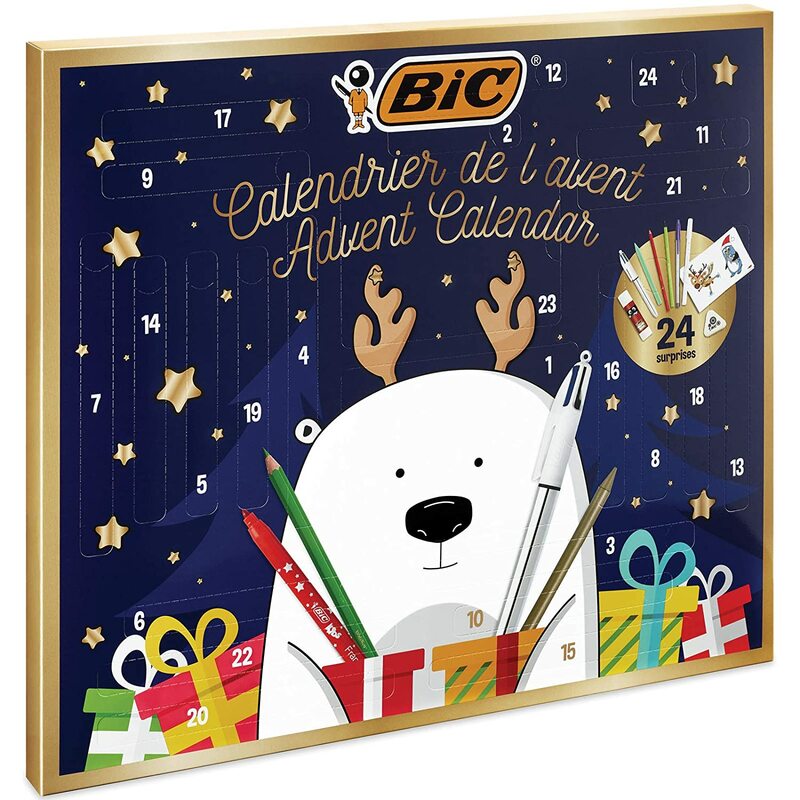 This BIC Advent Calendar is a great sugar-free alternative to the more common chocolate-filled versions and will appeal to most kids and encourage a bit of creativity in the festive period. It's a good size and has a couple of pre-cut hooks in the back to hang it up with, although it's quite lightweight and slightly flimsy feeling. 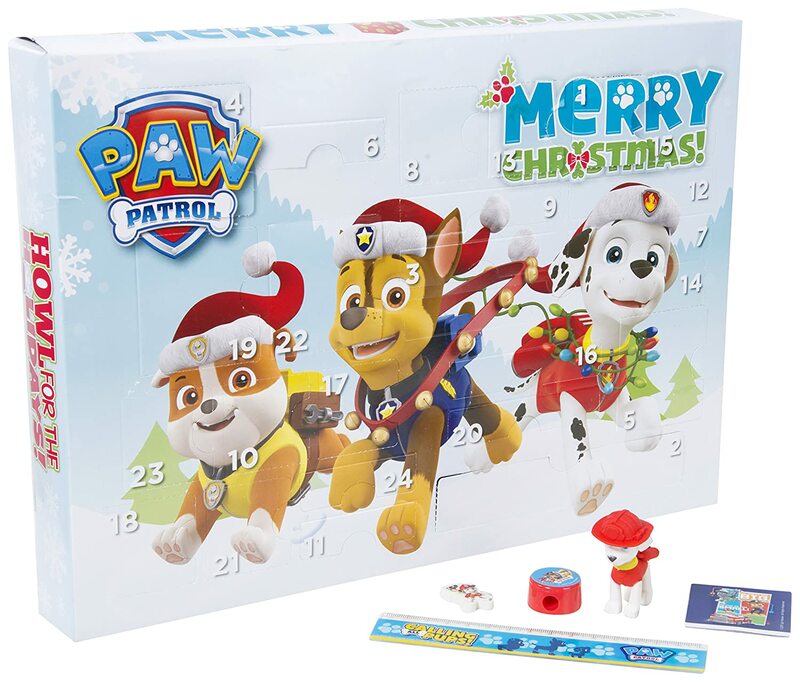 As with any advent calendar the kids will have to show some patience if they're to wait for each day's surprise and even though there's no chocolate inside it's still very tempting to open up another day to get another colour of pen or pencil and complete the set. 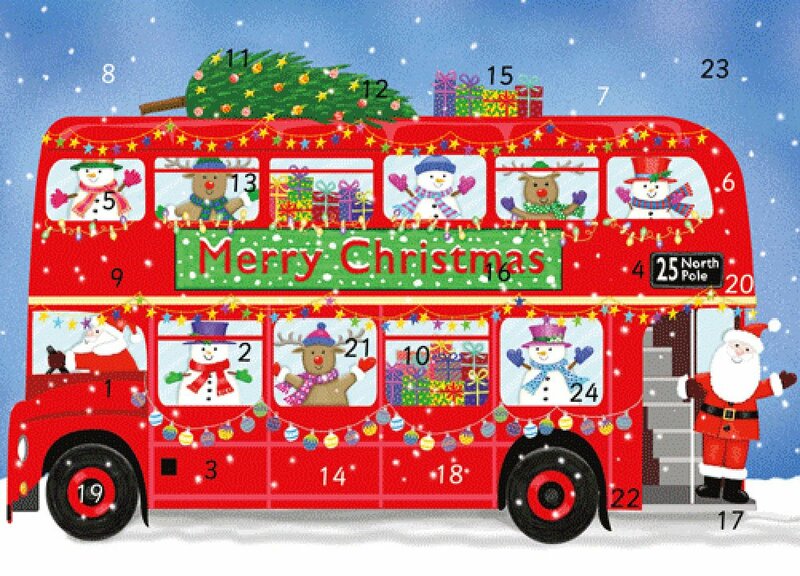 You start on day one with a set of Christmas-themed colouring-in cards and on subsequent days the calendar gives the pencils, crayons and pens you'll need to complete them. On the 23rd day you get a set of colour stickers and on the 24th you get an eraser - that seems an odd sequence to me and I'd have kept the stickers until last, but maybe that's just me? The kids will have to be a bit careful when opening up each perforated partition and the calendar looks a bit ransacked as the days go by, there's nothing behind the flaps once that day's pen or pencil is removed. It's also likely to cause a few arguments if it's being shared between several children, but maybe that's inevitable. It's still a fun and creative way to countdown until Christmas and the lucky child who gets to open it up will start the new year with a freshly-filled pencil case - and healthier teeth! 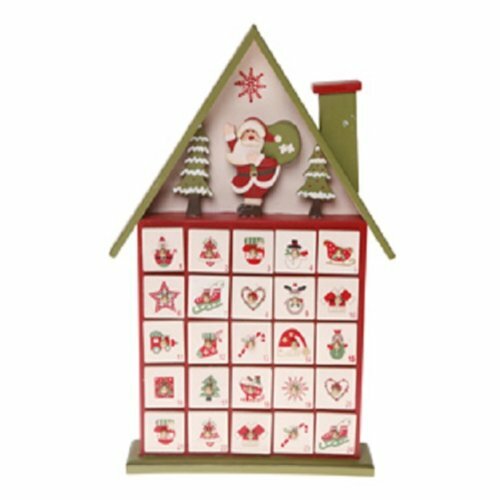 Wow - this advent calender is huge compared to the traditional styles seen in shops, but its 47x41cm size also gives a favourable first impression and is a generous gift to an excited child (or adult!) in the countdown to Christmas. Rather than include the conventional chocolates, sweets or small worthless novelties, this calender is packed with artistic materials for any budding artist in the family. The first door opens to reveal a pack of 24 colouring-in cards then over the following days, future doors unveil a range of colouring ballpoint pens, felt tip pens, Evolution wood-free colouring pencils and plastic crayons which can be put to use in colouring the 24 cards and will keep children amused for a few hours, rather than the few minutes other calenders occupy while chocolates are gobbled down. In addition to being more original, it is also healthier in encouraging children to use artistic talents and amuse themselves rather than rely on sugary treats and sweets thus getting them into better habits from a young age (and I write this as a chocoholic myself!). 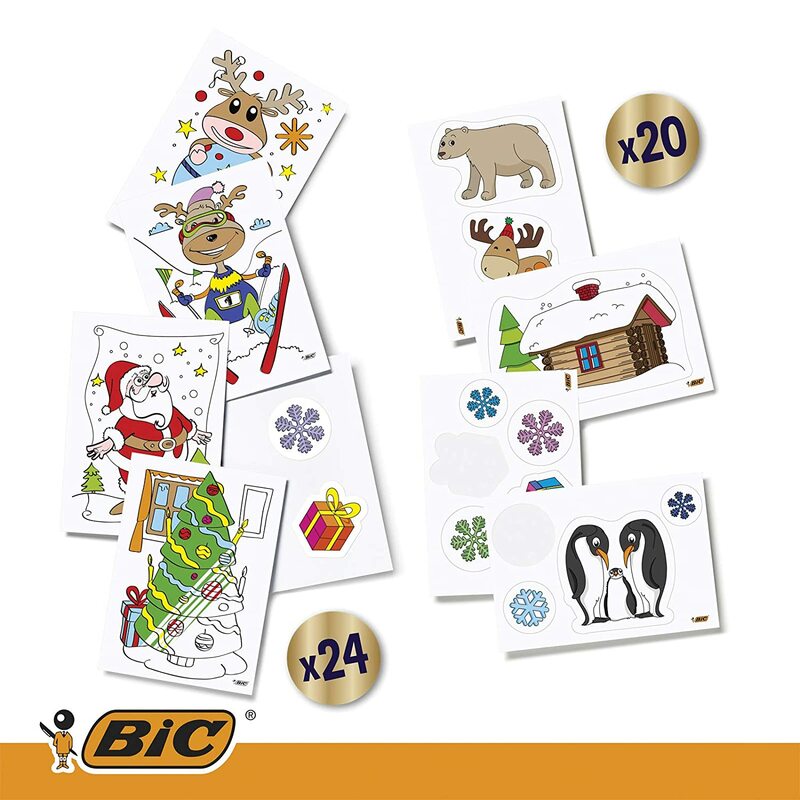 Finally, on day 24, ie Christmas Eve, a pack of stickers is revealed which can either be added onto the colouring cards, used to make new cards or added to Christmas gifts. 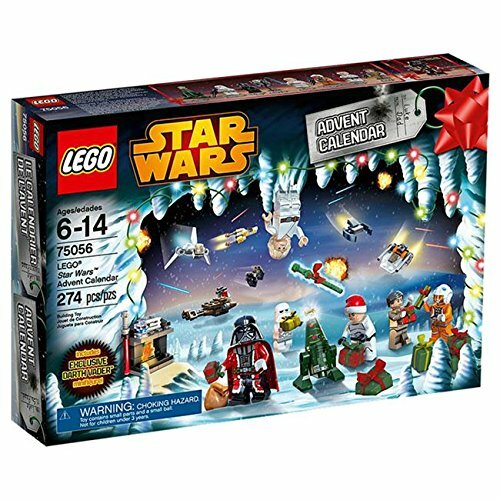 What surprised me most was that the outside of the advent calendar felt thin cardboard and not that strong when opening up the doors of it either. However the contents inside are much better than the outside packaging thankfully. Loads of colours, pencils, erasers and Christmas cards. To me though I would think it best given maybe in November start of. Rather than December daft though it sounds as otherwise by the time the end date comes the cards will be too late to send or give out. 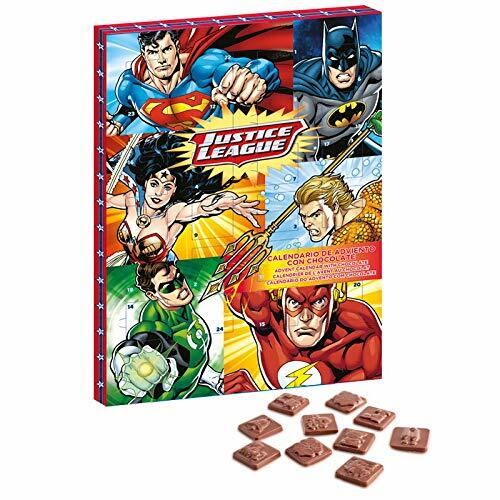 This is a much healthier alternative advent calender than sweet filled ones and one that will give amusement and entertainment to the recepient. Plus the items apart from the Christmas cards once done can all be used through the year afterwards too. Is it worth the full price I asked myself and think if the outside were thicker quality cardboard maybe not though as it feels so thin and cheaply made. Shame as the contents seem good quality.